Next up for Freakroom is the Twinkle Star Mythril Horn of Ocean soft vinyl. The Valentine's Day-themed piece casts the rather peculiar fish in a whole new light. 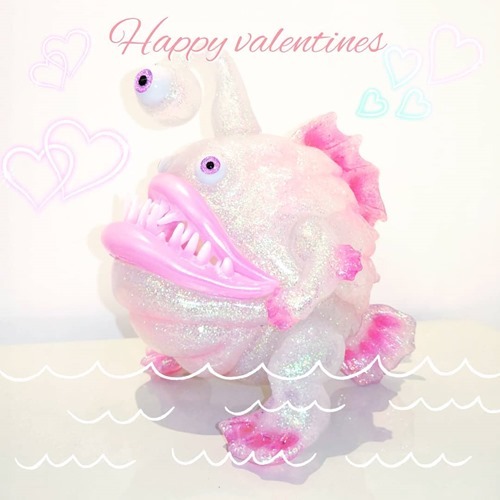 The three-eyed denizen of the deep is ready for love with a humorous new pink + glitter design. While the figure may seem to be of an imaginary beast, it is in fact based on the bizarre appearance of the very real Anglerfish. This lovely edition follows the sold-out Crystal Frog edition which dropped last month. Be sure to follow the artist for a Twinkle Star lottery announcement shortly.